Let's start by talking a bit about the wonder of science. Much has been written about this before, by better writers than me, but let me have a go too, because it's something that inspires and motivates me. A quotation that often comes up in this context is one attributed to the great English poet John Keats. The quotation famously says that Isaac Newton "has destroyed all the poetry of the rainbow, by reducing it to the prismatic colours." Taken out of its original context, this is sometimes interpreted as Keats commenting that science is a soulless, mechanical, reductionist endeavour, which robs the natural world of beauty and art. Some people, alas perhaps many people, actually agree with this sentiment. They see science as a cold and heartless process, designed to reduce humanity and the natural world to a series of equations and to create ever more unnatural horrors. But this is not what Keats actually meant. His words were spoken in jest, preceding a humorous toast to "Newton's health, and confusion to mathematics" - a toast which produced much mirth in his dinner companions, according to Benjamin Haydon, who hosted and recorded the event. The early 19th century, in which this dinner was held, was a time when even poets were being excited as the world was swept along by the rapid advances in human knowledge and ingenuity. Poets and writers mingled with scientists and engineers, and all looked forward to a brighter future for humanity with the fruits of the new sciences. Nevertheless, the accusation stands in some people's minds. 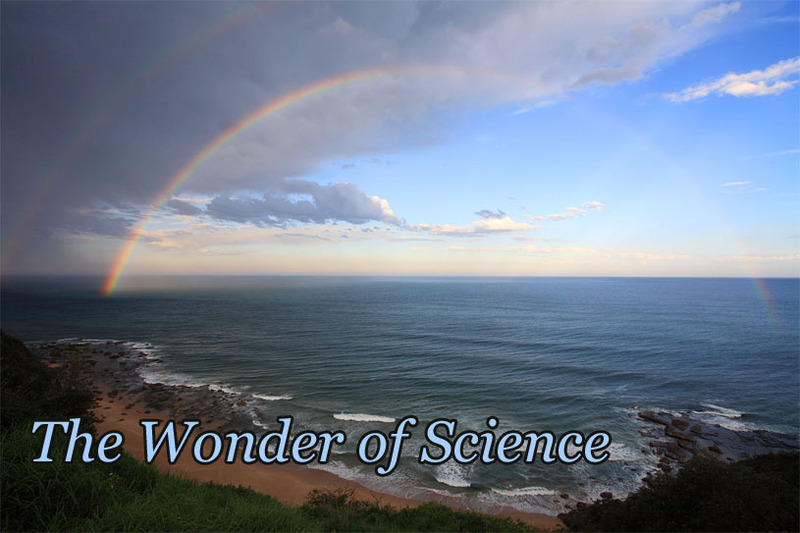 How can you look at a rainbow and feel any sort of wonder or magic when you know it is merely the separation of colours from sunlight caused by refraction in drops of rain? I would invert the question: How can you look at a rainbow and feel any sort of wonder or real appreciation when you don't know it is the separation of colours from sunlight caused by refraction in drops of rain? Is it better to walk around in the world and not understand anything of what makes the sun shine, the rain fall, the trees grow, the birds fly - than to have some idea about nuclear fusion, the water cycle, photosynthesis, and aerodynamics? Sometimes I go out and my mind is on other things: work, or the friends I'm going to see, or the shopping I need to do. At those times, I basically ignore the natural world. I'm shut into my own little blinkered world and the most attention I pay is "there's a tree, be careful not to walk into it." And you know what? That's kind of boring. I feel like an adult full of responsibilities, trying to make my way through a complex and daunting world that I don't fully understand. But at other times I have fewer pressing issues on my mind. In these times, I let myself look at the trees, feel the warmth of a breeze on my face, admire the patterns in the clouds, be conscious of the songs of birds. I find myself noticing unusual little things and staring at them and wondering why they're there and why they appear the way they do. I walk around like a child in a candy store, eyes drinking in the world, revelling in the astonishing beauty of it all. And at these times, it's good to know why things are the way they are. To know that flowers are there because they are the plants' way of reproducing, and that they have sweet scents and bright colours to attract insects and birds, who carry the genetic material from one plant to another so that the plants can mix their genes and diversify with genetic variation, the result of this being that the plants slowly change over time to better grow in their environment. That's amazing! How impoverished your experience of the world if you don't know any of these things, and the only thing you can appreciate about a flower is the beauty of its shape and colour, without having any idea why they are so. Interference patterns on a CD. Going back to rainbows briefly, in what sense is it better to look at a rainbow in ignorance of how it is formed, than to understand that the colours are produced by the dispersive refraction of the composite that is white light, so that different wavelengths of light—which we perceive as colours because of the structural intricacies of our eyes and brains—are bent through different angles inside drops of rain? 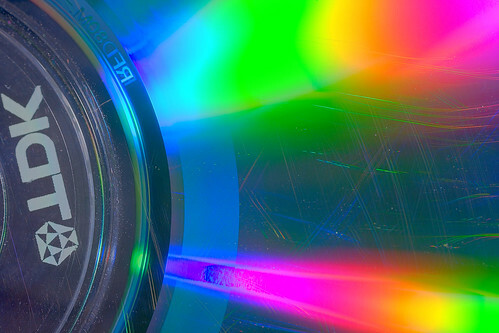 In what sense is it better to see similar rainbow colours in the patterns reflected off a compact disc and have no idea what causes it, rather than to know that it arises through destructive and constructive interference of the tiny waves that make up light—a completely different mechanism to how a rainbow in the sky is formed? If you understand these things, it opens up a completely new, and much deeper, sense of wonder in the universe than the wonderings of ignorance. It opens the way to appreciation of how the universe works, and wide-eyed curiosity rather than fear or unfounded superstition when confronted with new phenomena. When I look at a tree, I can see the beauty of its form, the gloss of the leaves, the intricate shape of the bark. I can also appreciate the intricate nature of its internal plumbing, that draws water up through tiny capillaries to provide raw material for photosynthesis in those leaves, which produces the sugars and other carbohydrates that grow to make more tree, out of nothing but the chemical combination of water and air, powered by sunlight. Less poetic and beautiful? I think not. Do an experiment for me. Because science involves getting your hands dirty (sometimes literally). Go for a walk outside and clear your mind. Don't think about work or school or whatever your friends are doing. Just clear it out so you have room to appreciate what you're seeing. Look at trees, clouds, shadows. Animals if there are any around. Flowers. Take a close look at plants and try to find insects on them. Look at lamp posts, at fences, at cracked bits of paving, at bicycles. Go up close and have a good look at peeling paint, spots of rust, chips, and cracks. Look at dirt. Look at water. Think a little bit about how each of these things came to be there, how it works, what makes it look the way it does. In some cases you might know. Think about metal and its interaction with oxygen in the air, the exchange of electrons that leads to chemical bonding, and how that forms spots of rust. In some cases you might not know. But have a think anyway - wonder why the shadows of things close to the ground have sharp edges, while the shadows of things further away are softer and blurry. And if you find something that you don't understand deeply, remember it when you go back inside and look it up and try to find out why. Now when you look at the world in this way, don't you find it more amazing and interesting and wonderful than when you wander around in a daze thinking about work or school or not missing your bus or whatever? Turning a bit of a corner at this point: Think for a second about why "making of" extras on DVDs are so popular. Often the technicians and artists behind the amazing special effects in a movie reveal how it's all done, sometimes in surprising and eye-opening details that you'd never have suspected. You can see the results in the movie, but understanding how they're made increases your appreciation for them, where otherwise you'd just blithely ignore them after the movie is done. 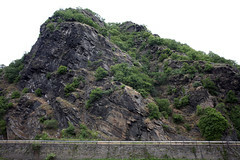 Rhenish slate, Rhine River, Germany. Slate is formed from the compression over millions of years of shale, a different type of rock. Both rocks have a layered structure that allows them to be peeled apart into sheets, but slate is harder and denser, the product of those millions of years under high pressure deep beneath the ground. Shale itself is formed when layers of mud collect at the bottom of standing water and then dry out, harden, and become compressed over tens of millions of years. When the mud collects, animals can get caught in it. If the conditions are right, their skeletons and sometimes fragments or impressions of the soft tissues can be preserved in the layers as more mud accumulates on top. Erosion of nearby landforms brings more material into the depression, covering the hardening mud. Movement of the Earth's crust can bury the results for millions of years, before thrusting it up in seismic faults that produce chains of mountains. Weathering by wind and rain and sun and ice peels off the covering material and then eats into the layers of what is now slate, revealing the characteristic layered structure revealed in a hillside, often lying at an angle to the horizontal - an angle caused by (and evidence for) the movements of the Earth. And lying inside those layers of rock are contained the remains of those creatures from millions of years ago who happened to get stuck in a muddy pond, giving us glimpses into an unimaginably distant past, when the world was utterly different and animals that no human has ever seen stalked our planet. Understand what slate is and you open up more amazing and wonderful things than you could ever dream up. So does understanding what makes a rainbow form remove any of the beauty or the poetry in it? Certainly not for me. I hope not for any of you reading this either. Benjamin Haydon (1929). "Chapter XVII 1816-1817". In Alexander P. D. Penrose. The Autobiography and Memoirs of Benjamin Robert Haydon 1786-1846. Compiled from his "Autobiography and Journals" and "Correspondence and Table-Talk". Minton Balch & Company, New York. p. 231. During an "immortal dinner" 28th December 1817 hosted by Haydon and attended by Wordsworth, Charles Lamb, Keats, and Keats' friend Monkhouse, Keats lightheartedly said Newton "has destroyed all the poetry of the rainbow, by reducing it to the prismatic colours." He then proposed a toast to "Newton's health, and confusion to mathematics" to the amusement of all. Last Modified: Monday, 21 April 2014; 01:01:37 PST.